Is it acceptable to use unicode fonts for general discourse (Questions/Answers/Comments)? 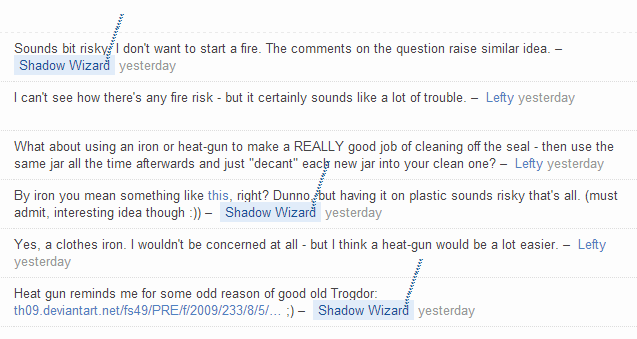 User augustine08282011 has written a number of comments in a weird (unicode?) font that won't display on my mobile device. I flagged it for a moderator to look at, but the flag was declined. Is it acceptable behaviour to use a ɟouʇ ƃǝuǝɹɐʇoɹ to create ẅ͓͍͕̫̾ͧ̊͑ė̵̜̦̯̝̞̐̓ḯ̥̱̙̈ͧ̀r̜͊̇͗ͪ̍ͮ̒͘d̵ͫͦͤ͛̌̄ͣ ͥ͒͋̎͂̓̀t̷͇̠ͯ͑͋ͣ̈́e͙͙̗̜̦x̢͍̲͐ͣ̚t̖͚̀̚ for questions, answers and comments? Anything beyond this will most likely cause readability issues, and as you mentioned in the question, may cause it to not display at all. Creativity and customization are wonderful thing, but for Q&A site, we want to keep styles consistent and easy to view to attract and keep experts. If the content you are posting is of a high quality to begin with you should not need to "spice it up" with these additional style edits. If the post is a question or answer, you have enough reputation, and knowledge to spot the problem code, you should edit the post to change the "personalized" text to a standard format. If the post is a comment, you do not have enough reputation or feel you do not have enough knowledge with editing, you should flag the post for moderator attention (IMO, moderators please comment if this is not what we want). You would need to use fifth option that allows you to give a specific reason. With that being said, a first time offender should be given a warning and a short explanation as to why we do not like this (maybe even a link to this post if you are feeling generous enough). First of all, some relevant nitpicking: This user is not using a different font, but special Unicode characters that are intended for Cyrillic, phonetics, mathematics, and other uses that are not regular (English) text. They render in the site’s standard font if available and some fallback font otherwise. Even if they appear to be from another font, they are just exotic characters. Accessibility: Just imagine, e.g., what a screen reader will do with those lines of text. Portability: Not every machine that is equipped for displaying this site typically has good or well-suited fonts available for these characters. And these are only the issues I can think of. Experience tells me that deviating from Unicode standards causes at least twice as many problems if you dig deep enough. The staff currently prefers to handle such situations manually, since the cost of a full-fledged fix doesn't still seem to be worth for the actual benefit. adds noise to search (obviously, you cannot search normally for words that were written using Zalgo or other unicode fonts). Based on that, I agree with Skooba - abuse should be dealt with, either by editing if possible or by resorting to flagging if no other option is available. Just remember that this is a weird topic with no general agreement, so try to explain your reasoning in the custom flag so it doesn't get dismissed as it already happened to you. Cats are not allowed to walk across keyboards as part of Stack Exchange posts; this is abuse and should be flagged as such. Such posts are deemed worth of a rude/abusive flag. By extension, I think that content written with Unicode characters or symbols-based substitutions should be handled in a similar way (BTW, I would wonder how those look like while using one of the available smartphone apps). What's going on with this question? Is a question that requires an associated chat for lengthy discussion on topic? Why were these comment flags declined, while the comments were deleted? What is the policy on unsourced quotes on SFF? Should I flag “Why all the Downvotes” comments as obsolete? Do we want to continue having a community blog? Why was this 'not an answer' flag on a rant about US declined? Why was my flag declined because the mods were “already aware of this user's struggle”?